At the NRA convention this weekend there were several companies offering various ways of concealing firearms in furniture. 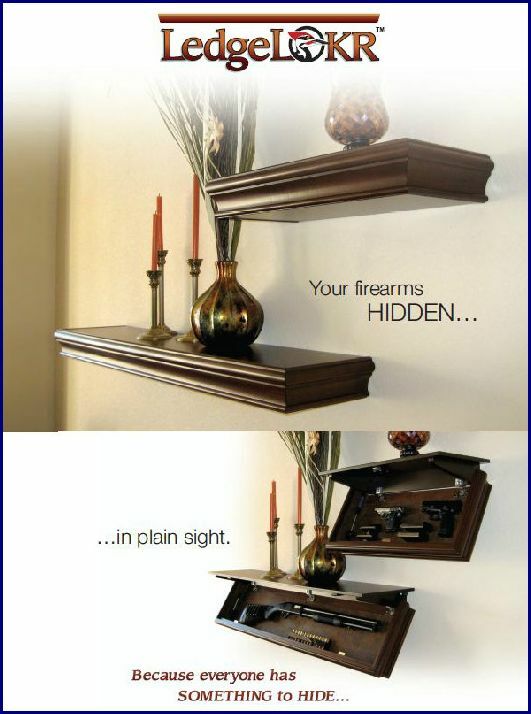 The different approaches and solutions to hiding firearms in plain sight vary by company but all are clever. Also exhibiting were the folks from LedgeLOKR. LedgeLOKR appears as a display shelf or mantlepiece but include a drop down compartment that can hold firearms. Features include a gas charged cylinder that quickly lowers the hidden contents but prevents the compartment from simply falling open and a very discreet locking mechanism that keeps access very quick and simple. 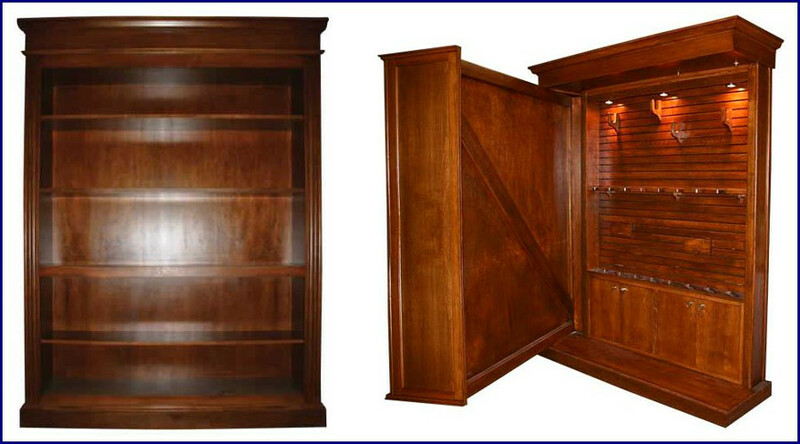 If you want the ultimate in customization and craftsmanship you might want to consider the ARMoire. Each one is custom designed to the customer’s specifications. The type of wood, finish, dimensions and storage configuration are all taken into consideration. Options include electronic opening with fingerprint or voice recognition and the ability to be wired into your home alarm system. Prices start at $10,500 for the base model and delivery time is stated at 90 days or less. In partnership with the NRA, Jotto Gear offers an in-wall diversion safe that is a bit easier to accommodate for those of us currently working the Dave Ramsey plan. 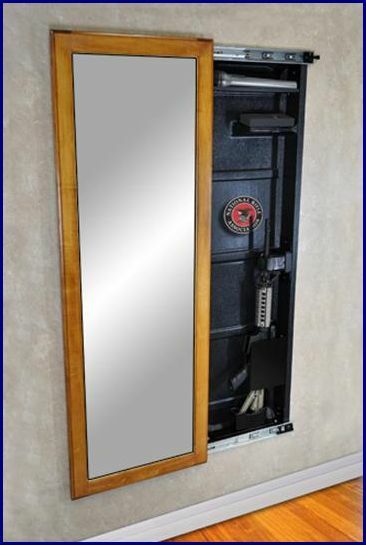 The NRA Home Defense Cabinet is similar to products from Tactical Walls and Stash Vault but incorporates a biometric fingerprint scanner to release the locking gun racks within. The scanner can hold up to 90 fingerprints (ten for you and the rest for whomever you choose) and can be recoded as needed. The unit mounted directly between wall studs (16″ ctr to ctr) and the frame of the mirror that covers it is shipped unfinished so you can stain or paint it to match your existing decor. I like the idea of concealed spaces just for the idea that if a thief doesn’t know about it, the contents can’t be stolen. Seeing new concepts marketed that also allow for some level of security and still provide quick access is encouraging. Update: While composing this I stumbled on Gentlemint’s extensive list of interesting objects with secret compartments. It’s worth perusing. You have to check out “TOP SECRET FURNITURE” this company builds very cool furniture with secret compartments, some of their pieces have wireless locks. Cool ideas! Keep up the good work. There all furniture designs are good looking and LedgeLOKR’s shelf is very impressive in its discretion and function. Check out QLine Design if you are looking for fine custom furniture with hidden compartments to conceal guns and jewelry. They are not cheap, but probably the very best quality of all. I’d like to order this and send to my Son. Have you seem a clock that hides a gun. I have on one of the pages. Please let me know how to order.